I've been part of several educational projects with different schools involving music and languages in choir and performance projects. Here a link to support a wonderful project happening at Maypark school in Bristol. 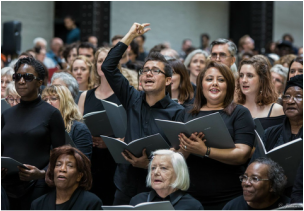 Saturday 18th June 2016 will be in the memory of hundreds of singers who took part in the opening of the new buildings of the Tate Modern in London. More than 20 choirs took part in this event including the 3 choirs I lead: The LOLCHOIR, the SOAS World Music Choir and The STAPLETON Singers. Here a couple of links to articles, more pictures and even a short video of the event. For more pictures click here and for the video click here. 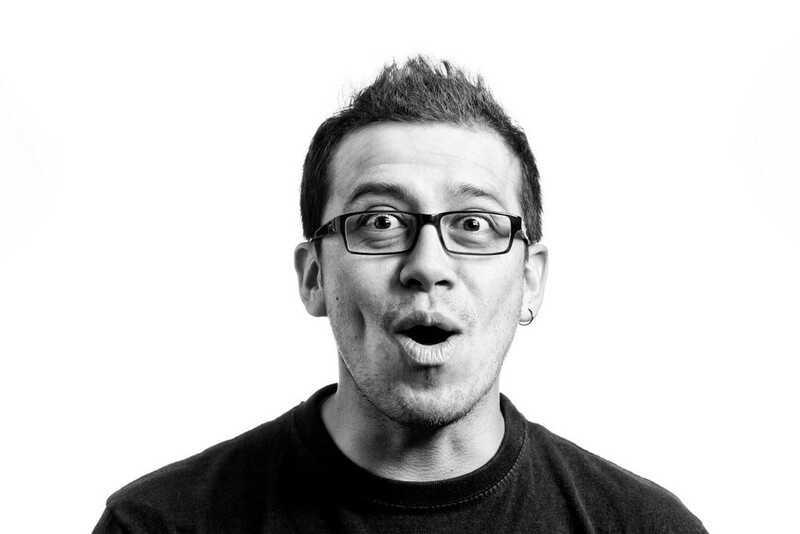 "Que viva el canto comunitario!!!" Article on the independent. Click here. There will be an article about my music and my life written by Claudia Forero in the 5th April edition of "Express News", a local newspaper focused on Latin American culture in the UK. 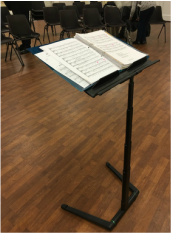 ﻿A workshop with the "Mickleham Choral Society"
In early October 2015 I had the pleasure to lead a great group of singers in Mickleham, willing to learn something quite different from the repertoire they are used to sing. They were amazing, and they called me back in 2016 to have another session as they will be singing a Colombian folk song arranged for choir by Alberto Carbonell: "Prende La Vela", for a choral competition. That one is a challenging piece (specially the rhythm). 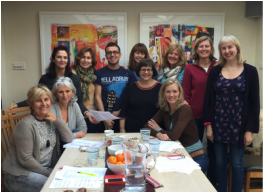 "2015: A year of Latin American songs for vocal groups in London"
In April 2014 I had the great experience of being part of the "CHORUS FESTIVAL" at the Southbank Centre in London. 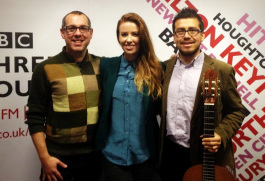 I was invited to run an 'all day' singing workshop/performance of Latin American songs in harmony. 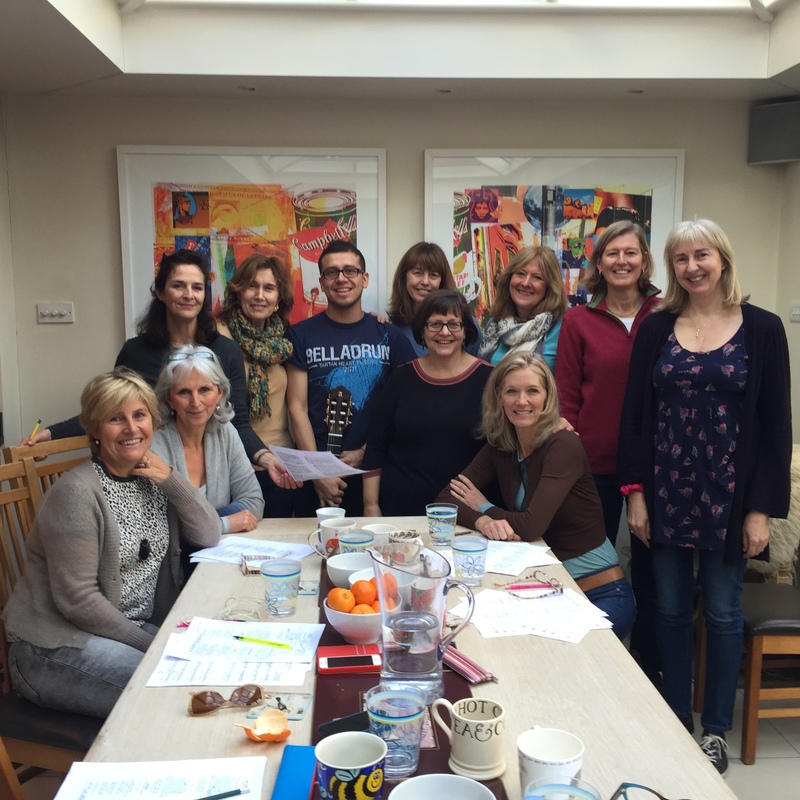 It was such an amazing experience, where I met lots of singing lovers including of a women's a cappella group called "The Treblemakers" who invited me to run a workshop for them in February 2015. Here a picture of our session with the satisfaction of good singing done :). Mixtape Manifesto seeks a competent, confident tenor to join our vocal group. We're a group of 10 friends who sing everything from Stevie Wonder to Air in five-part harmony and rehearse every Tuesday night, 7-9pm, in London. Lead vocals may be required on some songs. Contact us to arrange an informal audition. 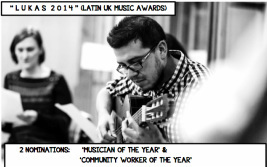 "Double Nomination for the LUKAS AWARDS 2014"
A few days ago I had a great interview with Charlotte Mackenzie about my musical endeavours, the fact making it to the final on the Latin UK Music Awards (LUKAS 2014) in two different categories -Musician of the Year- & -Community Worker of the year-. Click on the picture to read the article. Cheers! 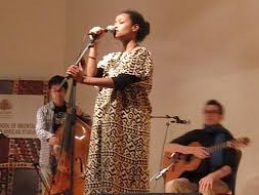 Amira Kheir Quartet: Holland Tour, what an experience! 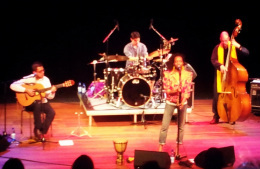 I'm back in London after a very successful tour with Amira Kheir, Leandro "Lele" Mancini and Ben Hazleton in the Netherlands. It was great to play in all those cities with standing ovation in every single concert, meet new people, share our music and confirm that music brings people together, heals and its one of the few healthy addictions I am proud of have. Keep an eye on our next move. I'm happy to share with you the excitement about going on tour to Holland with Amira Kheir Band. We will be performing in seven different cities in a 4 piece band format with Amira Kheir on vocals, Ben Hazleton on double bass, Leandro "Lele" Mancini on Drums and percussion and me on guitar. Changing subject, I'm happy to say that I made it to the second round on the Latin UK Awards in the four categories competing, all thanks to your help and support. The results will be shown on the 17th of February on the LUKAS site. Thanks again for your help and keep voting!!! 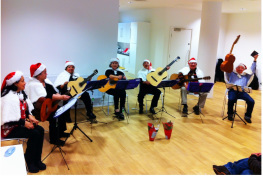 Last Tuesday I had the last Guitar lesson of the year with one of my favourite groups by far. They are all from South America, in their 60's and 70's and they are very dedicated to learn Guitar. I learn from them and they from me. Merry Christmas to them all! Hiya! I'll be playing live with Stephanie O'Brien in the Nick Coffer radio program at the BBC Three Counties at 1pm. In case you missed it, click on the link to play it on the BBC Iplayer.